The Blackboy Hill Commemorative Site features a series of sculpted arches, designed by Ean McDonald, symbolising the spirit of the Australian Imperial Force (A.I.F) over the rising sun of its badge. The arches are situated such that they face the sun as it sets on 24th of April, which on this evening is aligned through the arches with all other elements of the memorial. Blackboy Hill was the birthplace of the Western Australian A.I.F (Australian Imperial Force) and was the largest Western Australian military training camp during the First World War, with over 32,000 troops training there from 1914 to 1918. The site was dedicated by Bishop Tom Riley and the first sod turned by Governor Sir Charles Gairdner in 1958. 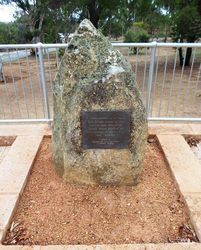 The precinct contains commemorative arches erected in 1962; the memorial seat to honour the Gallipoli legion erected in 1964; a lone pine tree from Gallipoli planted in 1969. The site was dedicated as a Memorial Site in 1959. Blackboy Hill at Greenmount was part of a grant of land to Captain Stirling. In 1914 a camp was set up on the hill where 32,000 men, about 11 percent of the whole of the State’s population, were trained for the Australian Imperial Force. In 1957 the Returned Services League, learning that the State Housing Commission intended to build housing there, asked for some of the land to be a commemoration site. Commemorating the Spirit of ANZAC arising from this soil of Blackboy Hill. Gallipoli Legion of ANZACS W.A.